Aisle-Master will be exhibiting an AC electric powered forklift from its range of articulated trucks on Stand 69. 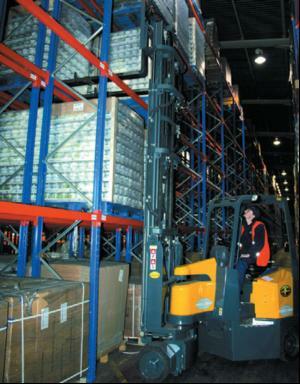 Aisle-Masters can replace a combination of reach and counterbalance forklifts, reducing working aisle widths for an increase in pallet density - in some cases doubling the amount of storage space available. The Aisle-Master's manoeuvrability and versatile operation enables every inch of warehouse space to be used, avoiding the need to use outside storage areas and saving outlay on rent for additional storage space. The AC technology incorporated in all electric Aisle-Masters offers benefits such as a smoother drive for operators, fewer wearable parts for low maintenance, reduced downtime and better energy efficiency. The performance of the LPG models makes them suitable for challenging conditions such as steep gradients and round the clock operations.